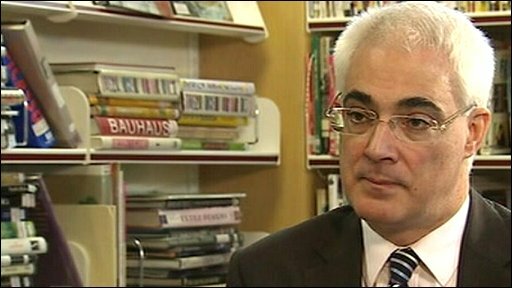 Darling: "The need to help countries is urgent"
UK Chancellor Alistair Darling has played down talk of rifts between the US and Europe ahead of the G20 summit. Finance ministers from leading countries are gathering in London to agree the agenda for the summit of world leaders next month. The ministers want to signal they are working together to tackle the worst economic downturn in 80 years. Mr Darling said differences in how much countries wanted to spend was not dividing US and Europe. "Generally, I think we are in agreement on the issues," Mr Darling told the BBC. "Of course, if you have 20 people i n a room, there will be differences. Each country has to decide what to do to their economies." The G20 includes the world's biggest industrial and developing countries, making up 85% of the world economy. World leaders will meet next month in London to discuss measures to tackle the downturn. See our in-depth guide to the G20 summit. The meeting this weekend is likely to focus on the need for more funds to tackle the crisis and tougher regulation of banks. Ministers will meet for dinner tonight, when they will eat local specialities, before the meeting begin in earnest on Saturday. Earlier, Prime Minister Gordon Brown said that the world's biggest economies must work with other countries if they are to bring about economic recovery. "If what happens to a bank in one country can within minutes have devastating effects for banks on a different continent, then only a truly international response of policy and governance can be effective," Mr Brown said. There have already been signs of disagreement among the G20 countries over how much money governments should spend to get their countries out of recession, with Europe notably less enthusiastic than the US about further spending. World Bank president Robert Zoellick warned that stimulus packages alone would not be enough and that countries needed to sort out their banking systems. "If you don't take on the banking issue, the stimulus is just like a sugar high," he said in London. "It pushes some energy into the system but then you get the letdown unless you reopen the credit markets." But on Thursday, French President Nicolas Sarkozy said that "in Europe we have already invested a lot for the recovery" and that the priority should be "putting in place a system of regulation so that the economic and financial catastrophe the world is seeing does not reproduce itself". Chinese Prime Minister Wen Jiabao said that China had enough "economic ammunition" to launch a new economic stimulus plan at any time. Both Mr Darling and Mr Zoellick also urged the finance ministers to expand the resources of the International Monetary Fund (IMF), which lends money to countries in financial difficulties, a measure that has had growing support. Mr Darling told the BBC it was important to "substantially increase the amount of the money [the IMF] has got, particularly to intervene early in developing countries". US Treasury Secretary Tim Geithner has proposed tripling its resources to $750bn to ensure it can help all those caught in the crisis, and the EU has backed an increase to $500bn. Mr Darling has signalled that he wants to ensure that banks are forced to hold more capital reserves before they lend, and he also wants the power to stop banks over-extending themselves. "We really do need to agree an approach to sorting out the problems the banking system has throughout the world," he said. But there is disagreement over which international body should regulate the banks, with the IMF, the Financial Stability Forum, and other bodies all vying for a role. Mr Darling suggested that though regulatory rules will be discussed at the meeting at a global level, the bulk of regulation will still be done on a national level. The G20 is a diverse group, including both the leading industrial countries such as Germany, Japan and the US, and leading developing countries such as China, India and Brazil. Gaining agreement in such a diverse group of countries could prove difficult. Already there are pressures within some countries to restrict foreign bank lending by firms that have received government bail-outs. Mr Zoellick said a fresh approach to the world's problems was needed. "US consumption alone will no longer rescue the world," he said. "One will have to have a new model that must be broader and include the developing world." There is also likely to be debate about regulating tax havens, although Switzerland, Austria and Luxembourg announced changes to their secrecy laws hours before the start of the meeting. "The tide is turning," Mr Darling said. "People are willing, across the world, to look at things that were off the table before." Mr Brown also welcomed the move, calling it the "beginning of the end of tax havens". Mr Darling will have bilateral meetings Friday with Mr Geithner, as well as the Chinese finance minister and the treasurer of Australia. Mr Geithner also plans to meet Japanese Finance Minister Kaoru Yosano and European Central Bank President Jean-Claude Trichet. Mr Brown would like to make avoiding protectionism, promoting the green agenda, and helping developing countries the key priorities at the G20 summit. The prime minister will be meeting Germany's Chancellor Angela Merkel on Saturday and African leaders on Monday to discuss the summit's agenda. Mr Brown's office also defended the cost of the summit. His spokesman said it would be "modest and business-like" and would cost about £19m. That compares to the £80m cost of the G8 summit at Gleneagles in 2005, and the G8 summit in Japan last year that cost $280m.